2. Tags! Express your opinion on each article! 4. More accessible and intuitive topic management - you can now follow topics right from the article! 6. New iPad layout - including the option to block sources! - Discussed - the most discussed stories in the last week! 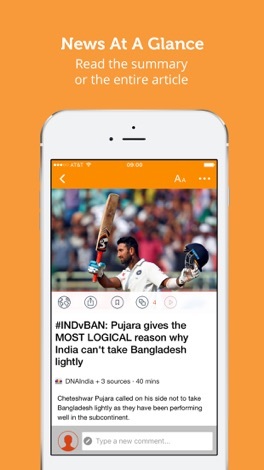 If news from India is what you are looking for and you like being updated on the latest events from the richest set of sources - this is the app for you! - News summary includes stories from all of the top sources! Clean feed with no repeated stories. For any story - you can see all of the sources that covered it with a simple tap. - Subscribe for push notifications for the categories/topics you're interested in (optional)! - Your very own news feed - choose the topics you want to follow, the topics you want blocked, and the topics you want to get notifications about! Don't bother yourself with news that aren't of interest to you! - Various videos of Indian news, politics, science, tech, entertainment and much more brought to you from the popular Youtube channels. - Join the community! Post stories or polls, comment on stories, and tag articles! - Read later - save interesting stories easily and for free! - Collapsed mode - an effective reading mode! Skim through the news and decide what you want to read, save or share! Full satisfaction guaranteed! And all this for free! Loved the app? Let us know by rating it high and sharing it with your friends! All Flags is a fun and simple educational tool for the serious learner. Quickly browse, search, and view the details of world flags Test your knowledge by entering country names or tapping the correct country's flag to answer.